The kids will love their stylish ride from behind the adults bicycle. 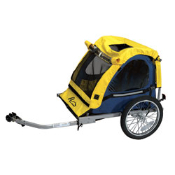 The removable canopy has a mesh bug screen and rear storage. Attaches to most bikes. Holds 2 children up to 40 lbs. each. Colors and styles may vary.